We have identified that there is currently no stand-alone Commonwealth-wide memorial statue to acknowledge the collective sacrifice of the fallen soldiers from a comprehensive range of Commonwealth nations who participated in the First World War. Our aim is to remedy this omission with the help of you and a coalition of supporters. 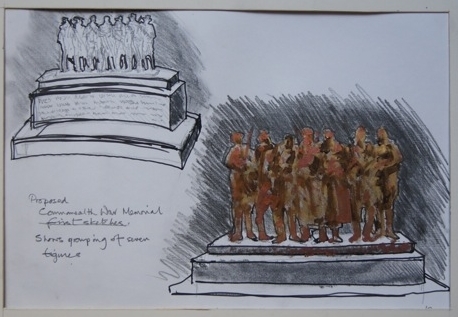 The sketches above are from the highly acclaimed and world renowned sculptor James Butler RA. We are honoured to have him associated with our project. Importantly, the statue should recognise the diverse nature of the Commonwealth. That means the depictions of those soldiers should resemble this distinct point. For this project to become a reality the first stage is to have a maquette (scale model) designed and then unveiled in November 2014. The maquette will ensure prospective donors can better visualise the memorial statue and allow the project to generate wider publicity. We don't want state funding and we want to keep it that way. This should be a Commonwealth people's monument, funded by the people, built by the people, owned by the people. It is our legacy. If you share this goal then we are asking for donations of whatever you are able to pledge to create the maquette. You can do so here. Together we will remember these once forgotten soldiers.